Television needs another law show like the real world needs more lawyers – which is to say, not at all. Into this overcrowded landscape we get USA’s new summer series SUITS, the latest “wacky” attorney drama, and it is about as welcome as getting a papercut from a frivolous lawsuit. SUITS has a marginally interesting premise: Mike (Patrick J. Adams) has a photographic memory that allows him to quote law books exactly – meaning he can pass the bar, but he’s not a lawyer. He’s an aimless pothead whose dealer buddy bullies him into working as a courier — and accidentally sets him up to be arrested. While ducking the police with a briefcase full of pot, Mike stumbles into a recruitment drive by the city’s top law firm. 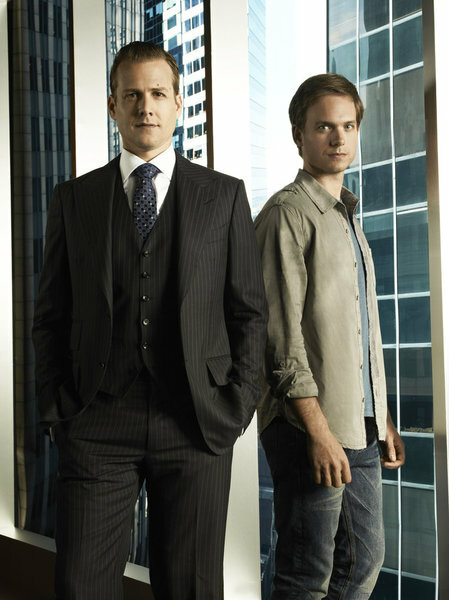 Harvey (Gabriel Macht), the firm’s self-obsessed ace, learns that Mike is not only not a lawyer but a stoner, yet he hires the kid anyway. Testy senior partner Jessica (Gina Torres) assigns Harvey a pro bono sexual-harassment case that he promptly pawns off on Mike, and together they find a brilliant way to win it. And then Mike decides he doesn’t need pot or his dealer pal anymore, and dumps him to make a go of it as an attorney. 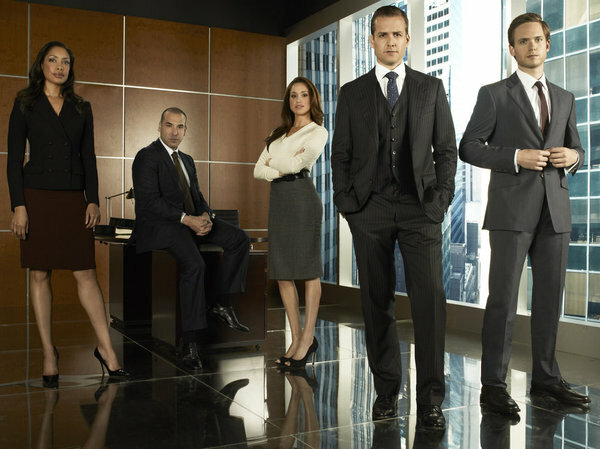 SUITS is at its least interesting when it pretends to be a by-the-book lawyer show. Of course the case is not as straightforward as it appears to be, and the witness is not who she appears to be, and… and… zzzz… What point was I making? Oh, yeah, the way SUITS apparently had a conventional law show grafted on top of a moderately interesting (but one-note) premise: Loser Mike is a law prodigy, but he’s not experienced and thus doesn’t know how to apply his knowledge. The script is extremely choppy and full of the same silly contrivances that pad out most legal shows, as well as a few pitfalls of its own. For instance, Mike has strange gaps in his book-learnin’ – he inexplicably doesn’t know how to fill out a subpoena form. And why did Harvey knuckle under when Jessica insisted that he take the pro bono case mere seconds after he had blackmailed her to secure a promotion? Is Harvey a cocky master of the universe who lies to clients, or a good soldier in service to the firm? He’s kind of both, which is silly, and poorly focused characterization. And that leads us to the show’s hugest problem: The characters are not very likeable, so who cares if they win or lose, or if their secrets are exposed? Harvey is alternately cruel and imperious, while Mike is simultaneously clever and totally gullible. I think the audience is supposed to find paralegal Rachel (Meghan Markle) adorable because her fear of tests prevents her from sitting for the bar, but she is so insufferably smug (constantly bragging about how everyone “ogles” her) that it’s a wonder she takes time out from patting herself on the back to be the firm’s brilliant researcher. It’s a shame to see FIREFLY’s wonderful Torres (ex-Zoe) reduced to playing a mean boss – although it is absolutely a positive to see a woman of color running a powerful law firm. Rick Hoffman, so memorable in Eli Roth’s gorefest Hostel, escapes this pilot in the best shape playing Louis, the company’s pit-bull disciplinarian. Just an observation: Macht plays Harvey Specter; is that a reference to his big-screen role as comic strip hero The Spirit? With its lugubrious plotting and repellant characters, SUITS doesn’t fit (sorry) with the rest of USA’s summer lineup, which prides itself on breezy adventure romps with fun, attractive people. In other words, SUITS is just unsuitable. This entry was posted in Series premiere, TV and tagged Gabriel Macht, Gina Torres, Meghan Markle, Patrick J. Adams, Suits. Bookmark the permalink.